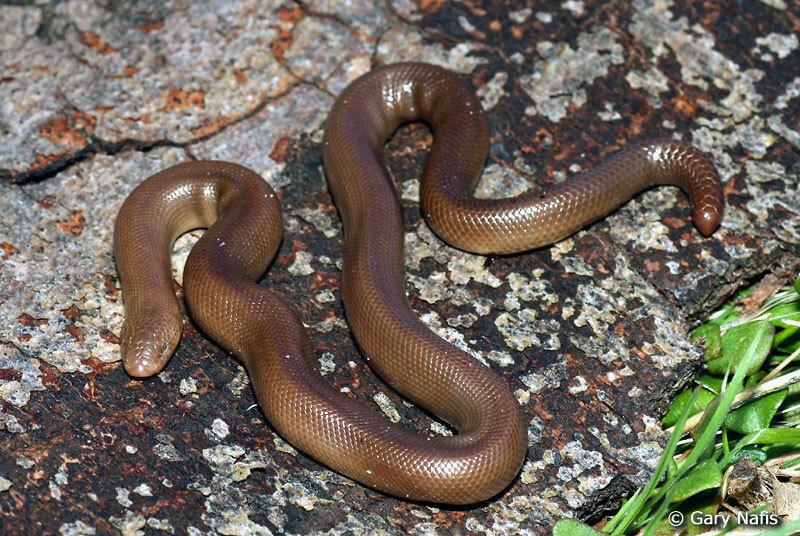 is recognized as potentially Southern Rubber Boa by the CDFW. boas of unexamined species, most likely Northern Rubber Boa. Adult, San Bernardino County Adult, 6,100 ft.
San Bernardino County Adult, 6,100 ft.
Juvenile, San Bernardino County Juvenile, 6,200 ft. Adult, 4,600 ft., Greenhorn Mountains, Kern County. C. bottae from the southern Sierra Nevada, including the Greenhorns, are a dwarf race. Underside of adult, Greenhorn Mountains, Kern County Adult, Mt. Pinos, Kern County. 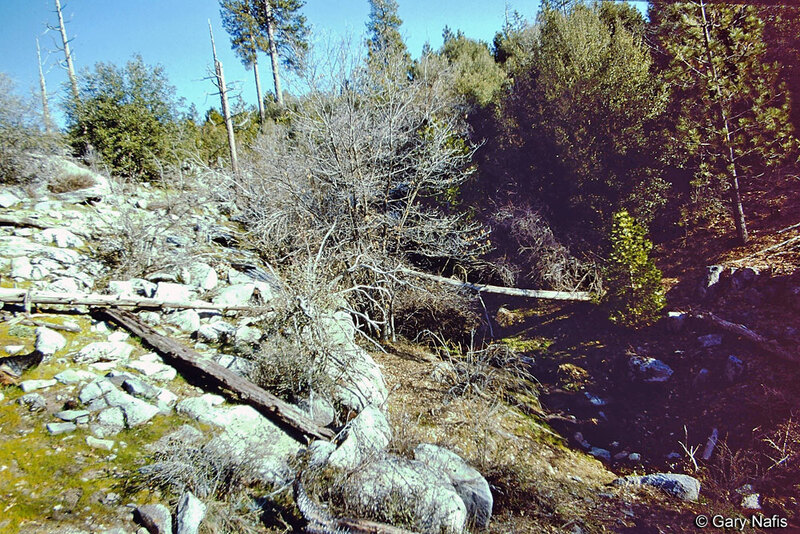 San Bernardino County Habitat, 5,800 ft.
San Bernardino County Habitat,6,200 ft. The maximum total length of males in the San Bernardino mountains is about 19.5 inches, and females about 22 inches. A small constrictor with a stout body and smooth shiny small-scaled loose and wrinkled skin which gives the snake a rubbery look and feel. Eyes are small with vertically elliptical pupils. The tail is short and blunt and looks like a head. The top of the head is covered with large scales. Uniform in dorsal color - light brown, dark brown, pink, tan, or olive-green above, and yellow, orange, or cream colored below. There is usually no pattern below, but sometimes there is dark mottling. 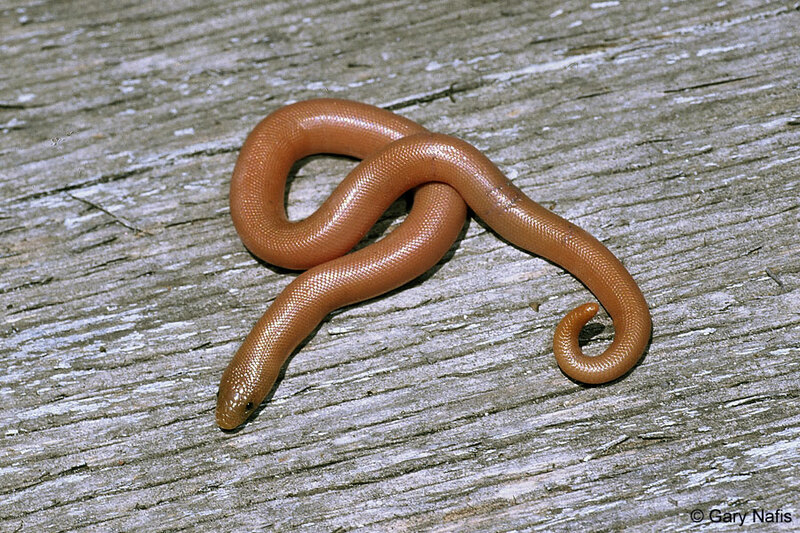 Young snakes are pink or tan, and can be brightly-colored. Nocturnal and crepuscular, sometimes active in daylight. Sometimes active in weather that would be too cold for most reptiles, with surface temperatures in the 50s. A good burrower, climber and swimmer. Often found under logs, boards and other debris, sometimes on roads at dusk. When threatened, the snake hides its head in its coiled body, and elevates the tail to fool the predator into attacking the tail. Snakes with scarred tails are common. Eats mostly small mammals, birds, and, lizards. Breeds from April to June, bearing 2 - 8 live young in late summer or early autumn. Inhabits Oak-conifer and mixed-conifer forests at elevations between roughly 5,000 to 8,200 ft. where rocks and logs or other debris provide shelter. The range of this species is unclear and somewhat controversial because of its protected status. It is definitely found in a few disjunct areas in montane southern California in the San Bernardino and San Jacinto Mountains. (Oddly, it is missing from the San Gabriel Mountains, where the habitat appears to be the same.) Boas occurring in the southern Sierra Nevada, the Tehachapi Mountains, and on Mt. Pinos, Mt. Abel, Mt. Alamo, and Frazier Mountain are protected as C. umbratica by the California Department of Fish and Wildlife. Nevertheless, their species status is still unclear. Pending more DNA studies, these could turn out to be C. umbratica or C. bottae or hybrids. Since the species of Charina occurring in the southern Sierra Nevada, the Tehachapi Mountains, Mt. Pinos, and in San Luis Obispo County has not been determined, and because C. umbratica is a species protected by the state, I will show a separate area in purple on my range map of Charina that are of unknown species, and another in orange of Charina that appear to be classified as C. umbratica by the CDFW, until I learn of new scientific studies that change this. Rubber boas were found in 2006 and 2010 at Montana de Oro on the coast of San Luis Obispo County, with photo confirmation in 2010. It seems most likely they would be C. bottae, but Stebbins & McGinnis (2012) state that C. umbratica occurs in the "northern part of the South Coast Range" which should include Montana de Oro, but until someone gets a permit to take a DNA sample from one of these snakes, which are found in a State Park, then finds another snake (which is not easy) and gets the sample tested, the species will remain unknown. "C. umbratica is found in the northern part of the South Coast Range and at selected sites in Kern, San Bernardino, and Riverside Counties. 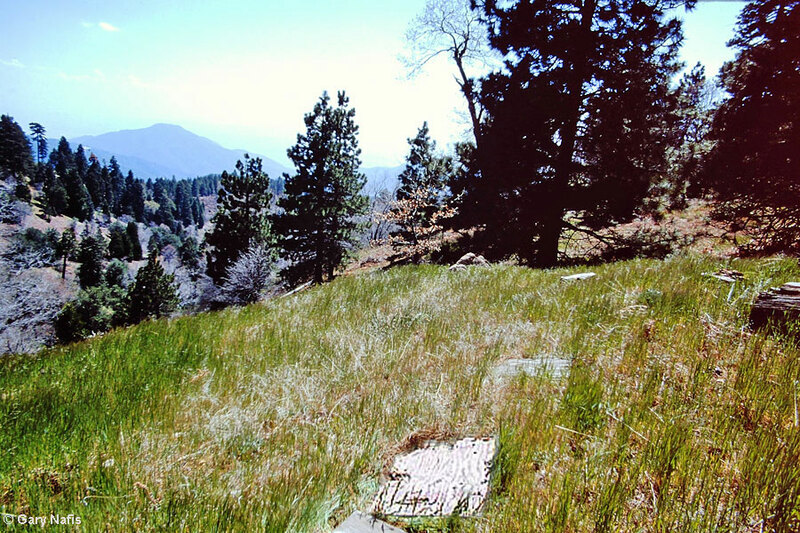 These include Mount Pinos, Mount Abel, and the Tehachapi, San Bernardino, and San Jacinto mountains…." "Range. - While at present known only from the localities where the type and paratype were collected [Mt. San Jacinto, Riverside County and San Bernardino Mountains, San Bernardino County. **], this subspecies may well be expected from moist areas throughout the San Jacinto and San Bernardino mountains, and possibly in the San Gabriels and other southern California ranges. Discussion. - So far C. bottae has not been collected in the Coast Range south of Carmel, Monterey County, nor in the Sierra Nevada south of Sequoia National Park, Tulare County. 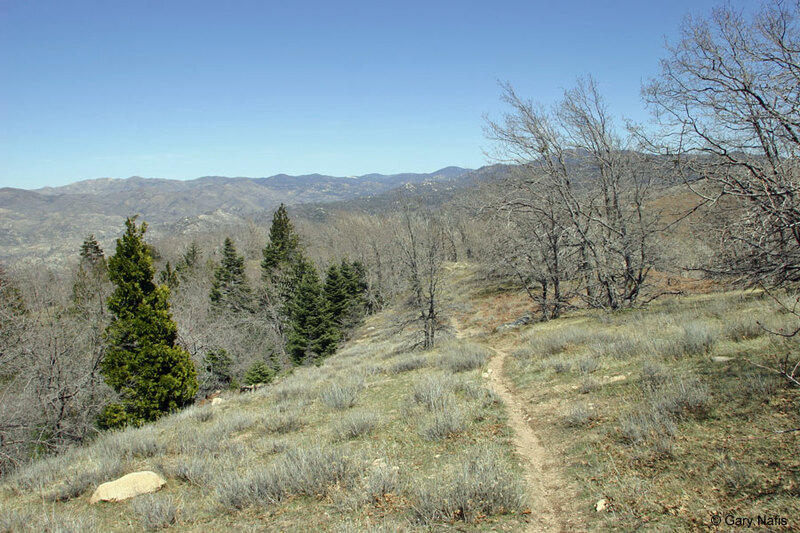 The latter point is about 180 miles from Switzer Canyon, the nearest of the umbratica localities. But as the characters separating this form from the other subspecies are differences of degree rather than innovation, and as intervening mountains make an almost-continuous range possible, I deem it best not to consider it a full species. 1"
"1 Charina is known to occur on Mt. Pinos, northern Ventura County, but as no specimens from there are presently available. it is not known to which subspecies this area should be assigned." ** "Type.-No. 12,101 in the collection of the San Diego Society of Natural History. Collected in Fern Valley, near Idyllwild, Riverside County, California, by Clyde Searl, July 1, 1929. Fern Valley is in the San Jacinto Mountains at elevation 5800 ft. The snake was found under a slab of fallen pine bark." of Pasadena Junior College. It was taken in Switzer Canyon, near Lake Arrowhead, San Bernardino County, California, by H. C. James, May, 1925. " Status of Rare, Threatened, and Endangered Plants and Animals of California 2000-2004 document (download the Reptiles PDF). 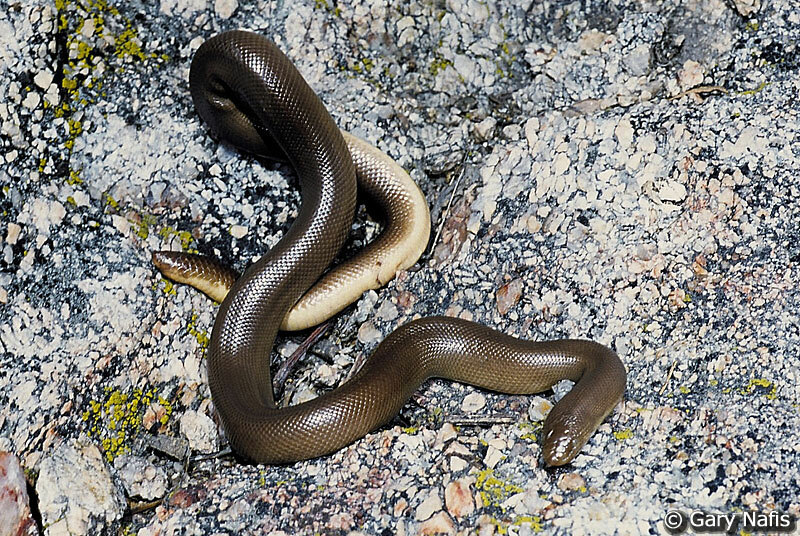 "The southern rubber boa is known from several localities in the San Bernardino Mountains in San Bernardino County, near Idyllwild in Riverside County, and on Mount Pinos in Kern County. 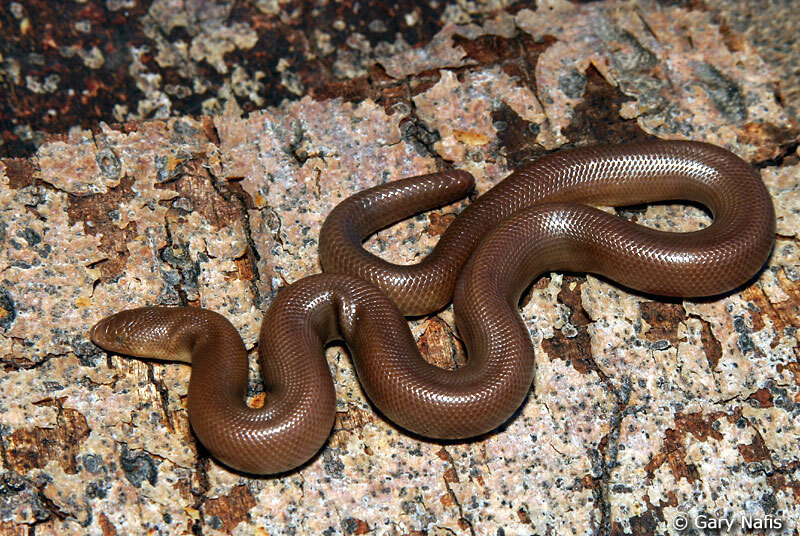 Recent genetic studies support separation of the southern rubber boa from all other populations of rubber boa. 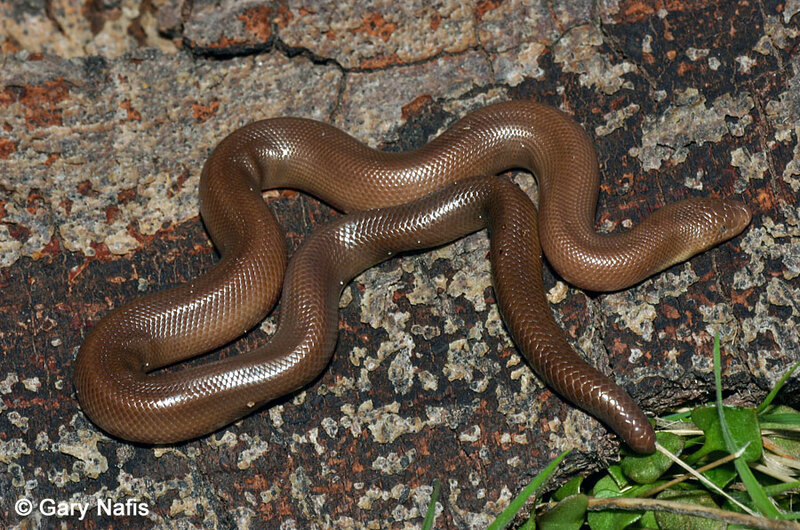 The subspecies appears to have diverged from the more widespread rubber boa between 12.3 and 4.4 million years ago. 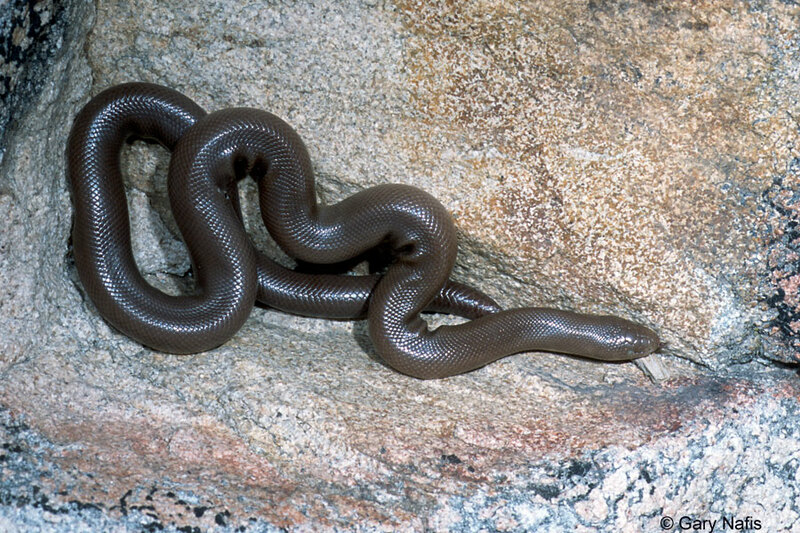 Possible intergrades between the southern rubber boa and the rubber boa found in the Tehachapi Mountains and on Mt. Pinos warrant further study." No other CDFW documents that I can find as of 1/15 mention boas in the Tehachapi Mountains or in the Southern Sierra Nevada in their range descriptions. The most current fishing regulations protect all Kern County boas from take, but that could be because of the Mt. Pinos Kern County population. "The only valid Scientific study that identifies the distribution of the SRB is the 1943 paper by L. Klauber in which he proposed adoption of the new SRB subspecies. That is, the SRB only occurs in the San Bernardino and San Jacinto Mts." 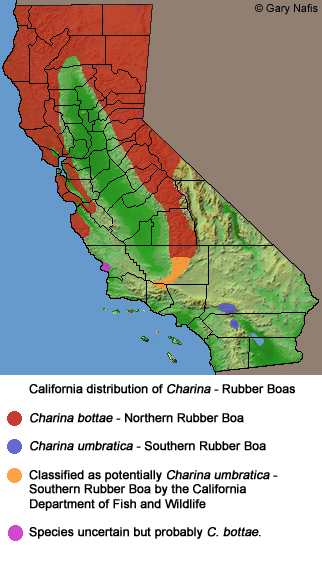 MtDNA work has shown that most (but not all) Charina in the southern Sierra Nevada and the Tehachapis are more closely related to Charina bottae than to Charina umbratica. "Morphologically, the Kern Plateau, Breckenridge Mountain, Piute Mountains, Scodie Mountains, and Tehachapi Mts populations all are comprised of "dwarf-morph" snakes [similar to C. umbratica] but that trait does not track with the mtDNA." (R.Hansen Pers. Comm. 4/13) Because the morphology does not correspond to the mtDNA findings, there is not enough evidence to support an argument that these populations belong to either species. "Global Range: (1000-5000 square km (about 400-2000 square miles)) Range encompasses the San Bernardino Mountains and San Jacinto Mountains of southern California; populations in the Tehachapi Mountains and Mount Pinos area have some umbratica characterisitcs but are included in the C. bottae (northern rubber boa) clade (Rodriguez-Robles et al. 2001, Stebbins 2003). Elevational range is 1,540-2,460 meters (Stewart 1988). Twenty-six of the 40+ localities in the San Bernardino Mountains are in a 16-kilometer strip between Twin Peaks on the west and Green Valley on the east (Stewart 1988). Extent of occurrence is less than 5,000 square kilometers." 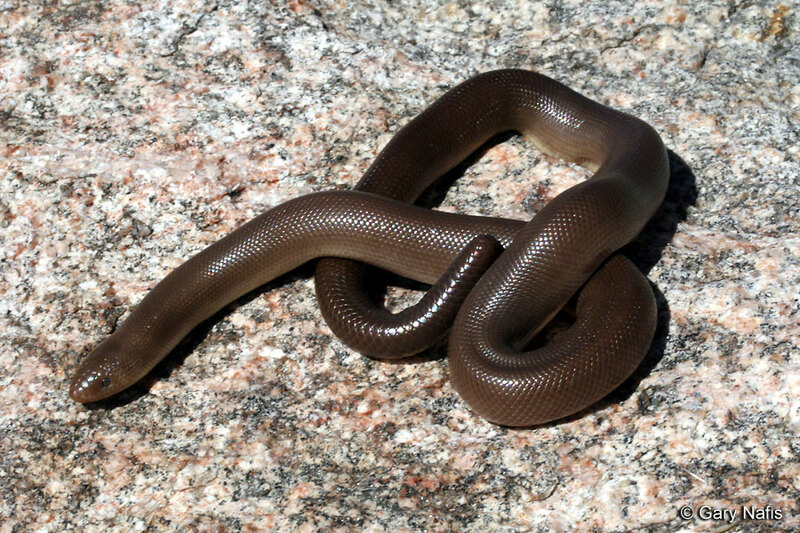 C. b. utahensis - Rocky Mountain Rubber Boa. 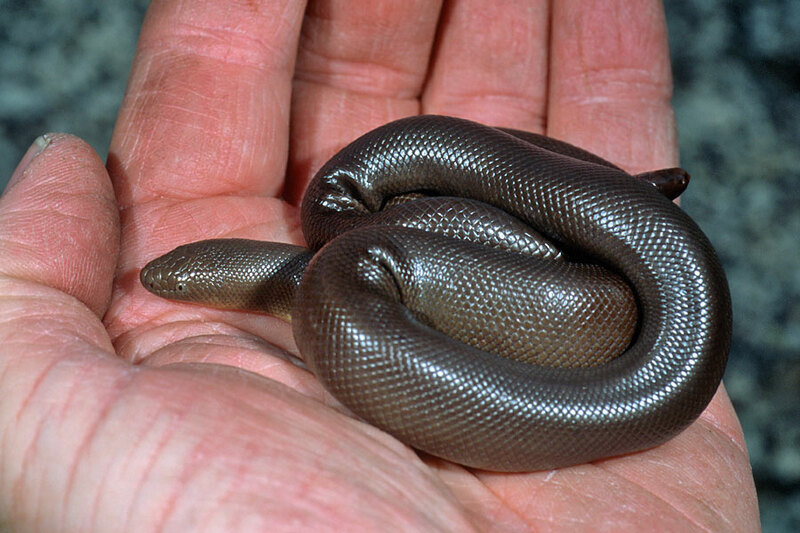 C. b umbratica - Southern Rubber Boa. 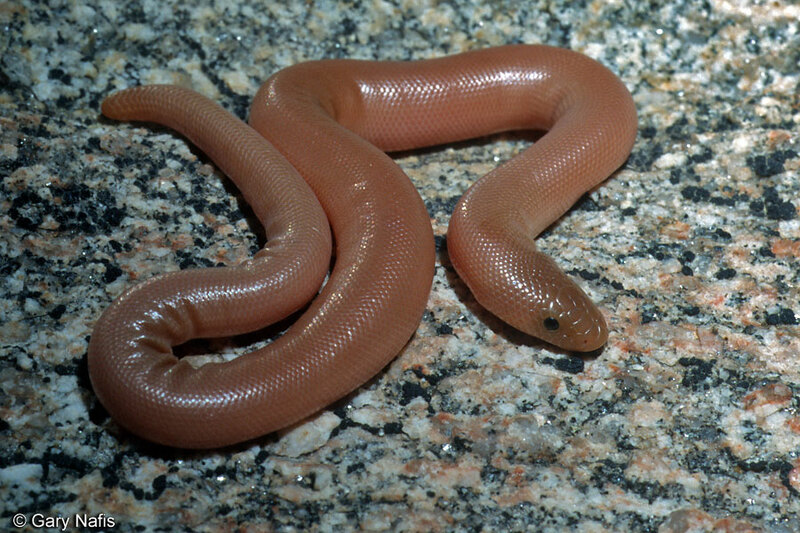 Charina umbratica - Southern Rubber Boa. "Nussbaum and Hoyer (1974) showed that subspecies utahensis is indistiguishable from subspecies bottae, and they regarded the concept "umbratica" as meaningless; Collins (1990) apparently agreed with this view and did not recognize any subspecies. 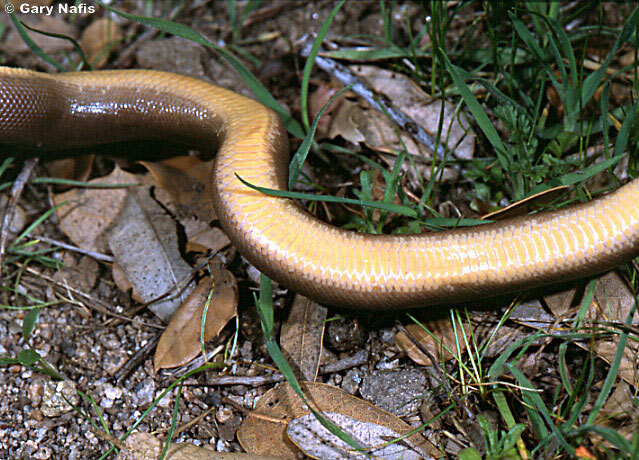 In contrast, Erwin (1974) proposed that subspecies umbratica warrants species status; this suggestion did not gain the support of other herpetologists. Stewart (1977) recognized two subspecies (bottae and umbratica) and, pending further study, regarded populations from Mt. Pinos and the Tehachapi Mountains, California, as intergrades between these two subspecies. Stebbins (1985) continued to recognize three subspecies (bottae, utahensis, and umbratica). Rodriguez-Robles et al. (2001) used mtDNA data to examine phylogeography of C. bottae and concluded that "C. b. umbratica is a genetically cohesive, allopatric taxon that is morphologically diagnosable" [using a suite of traits] and that "it is an independent evolutionary unit that should be recognized as a distinct species, Charina umbratica". 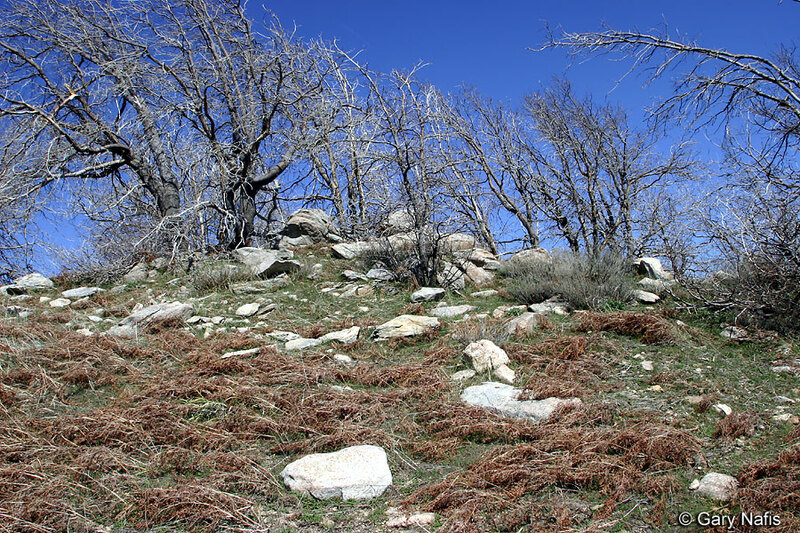 The authors acknowledged that a mixture of bottae and umbratica traits exists in populations in the Tehachapi Mountains and Mount Pinos, but they interpreted this as persistent ancestral polymorphisms. They also found no support for recognizing utahensis as a valid taxon. Crother et al. (2003) listed C. umbratica as a species whereas Stebbins (2003) mentioned the proposal but did not adopt the split. In this database we maintain umbratica as a subspecies of C. bottae until a concensus on the taxonomy of this group emerges." Distribution: "Global Range: (1000-5000 square km (about 400-2000 square miles)) Range encompasses the San Bernardino Mountains and San Jacinto Mountains of southern California; populations in the Tehachapi Mountains and Mount Pinos area have some umbratica characterisitcs but are included in the C. bottae (northern rubber boa) clade (Rodriguez-Robles et al. 2001, Stebbins 2003). Elevational range is 1,540-2,460 meters (Stewart 1988). Twenty-six of the 40+ localities in the San Bernardino Mountains are in a 16-kilometer strip between Twin Peaks on the west and Green Valley on the east (Stewart 1988). Extent of occurrence is less than 5,000 square kilometers." "Kluge (1993, Zool. J. Linn. Soc. 107: 293-351) placed Lichanura in the synonymy of Charina because they formed sister taxa. Burbrink (2005, Mol. Phylogenet. Evo. 34: 167-180) corroborated the relationship found by Kluge. However, Rodriguez-Robles et al. (2001, Mol. Phylogenet. Evol. 18:227-237) found C. b. umbratica to represent a morphologically distinct, allopatric lineage that they elevated to species status based on mitochondrial sequences, along with allozyme data from a previous study (Weisman, 1988, MS Thesis, CSU Polytechnic Pomona). With the recognition of C. umbratica and fossil species referred to both Charina and Lichanura (Holman, 2000, Fossil Snakes of north America, Indiana Univ. Press) neither genus is monotypic and they are treated here as separate genera." 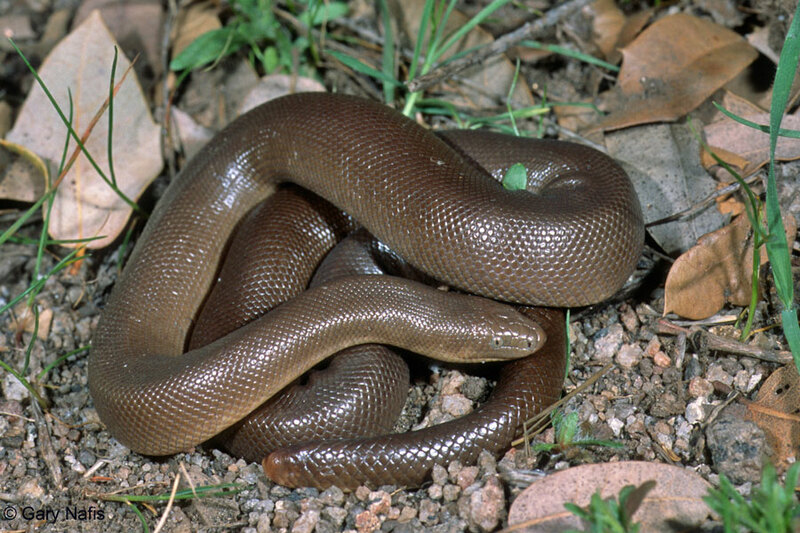 Common where it occurs, this snake is considered a threatened species due to threats from habitat loss and degredation due to human activities in its limited range. from Jaeger, Edmund C. A Source-book of Biological Names and Terms Third Edition. Charles C. Thomas Publisher, 1962. Klauber, Laurence M. The Subspecies of the Rubber Snake, Charina. Transactions of the San Diego Society of Natural History Vol. X, No. 7, pp. 83-90 December 30, 1943. Thelander, Carl G., editor in chief. Life on the Edge - A Guide to California's Endangered Natural Resources - Wildlife. Berkeley: Bio Systems Books, 1994.